Eisenbolt is a 2009 Hanoverian gelding. Sired by Escudo II out of Landkoenigin R, he stands at 16.2hh with correct conformation and a powerful build. The ultimate dressage prospect, this stunning chestnut has three fluid gaits. Very rhythmic and balanced canter. “Epi” placed first in the Open Walk/ Trot division for the Ontario Bronze Dressage Circuit in 2014. He came in second place for the Silver Open Walk/ Trot Division in the same year, and was champion for the entire Western Division. Epi has scored regularly in the 70% range, with judges’ comments including “lovely, bold energy”, “nice at all three gaits” and “lovely horse with expressive trot.” He has now schooled movements up to 3rd level, and is beginning training for more advanced movements. With his beautiful, round jump and superb movement, Epi has the potential to be an incredible show hunter. 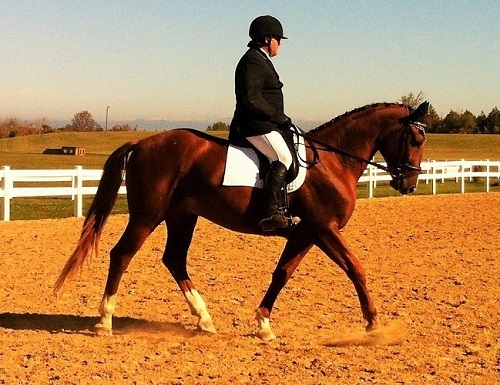 He has experience competing at hunter schooling shows, and always wins the hack class. Epi can comfortably jump a course at 2’9”, with the ability to go higher, and has experience over hunter, jumper and eventing style obstacles, both schooling and in the show ring. Epi is also a great hacker on and off property and trailers well. This magnificent and accomplished horse is ready for the show season with you!